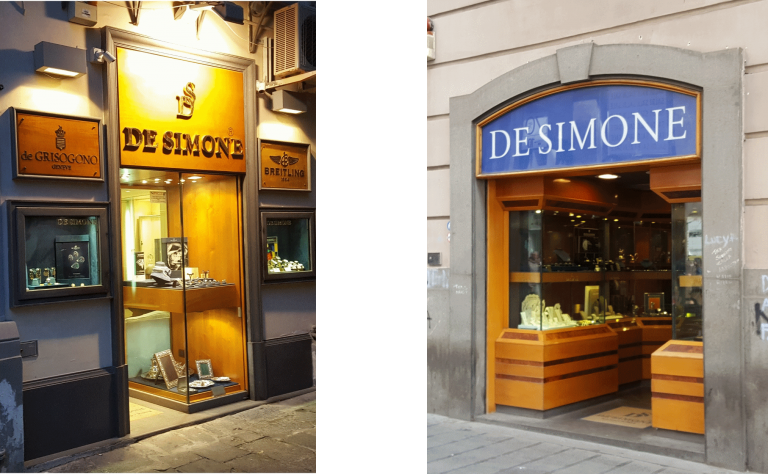 The De Simone Gioielli was founded at the end of 800 thanks to Gennaro De Simone, who opened a small jewelry workshop in the heart of Naples, more precisely in the area of neighborhoods Spanish, begins like a tradition that will become a milestone in the World Neapolitan goldsmith. With him is the young nephew Luigi learn that this “precious” art and after a few years (runs the year 1918) opens a shop in Via S. Biagio dei Booksellers. In 1921 was born the partnership with the family and then the opening of the Five De Simone & amp; Five in Via Toledo, one of the most prestigious areas in central city streets. These are the years in which the French high jewelry in platinum and diamond marks the fashion of the moment and goldsmith Luigi De Simone sensing that this is the style to follow begins to produce and sell items Art Deco style and the Egyptian Revival. In 1931, following the death of Antonio Five, Luigi De Simone remains the sole owner of the shop and begins a lucky climbing, thanks also the singers and operators of the world of the show at the nearby Real Teatro San Carlo starting to frequent the shop. After the Second World War Salvatore De Simone Son of Louis started working with his father and soon after he will take the reins of the activity that has meanwhile moved to Palazzo Cirella (Always in Via Roma) by shortening the distance with the Teatro San Carlo and then with the artists who are its main customers. While Salvatore has the intuition to use red color in the jewelry creation (much in vogue at the time) and to begin a collaboration with the Institute of Pegnorazione, with which soon will become Partner and manager, the institute converge all operators in the world of gold, because every month you keep the most important temples of urban jewels. In the ’50s and’ 60s De Simone in his careful interest in fashion and for precious, begins to produce white gold jewelry and with a high content of precious stones, the premise the customer the choice of precious metals and diamonds to be included in purchased items, this will allow him to further initiate the activity in the gold sector and position in Naples among the most established and listed jewelery retailers and precious, his store became a crossroads of many building contractors that at a time when the city is being reborn from the rubble of war decide to buy items for their family entourage. In the ’70s with Salvatore De Simone begins to work his son Louis, and in 1983 the two sensing that the main crux of the business has moved towards Via dei Mille, they decided to open a second store in Piazzetta S. Caterina a Chiaia, and then in 1987 opened a permanent summer exhibition at the Hotel Regina Isabella in Lacco Ameno on Ischia. The years up to 90 will be marked by a white gold back in jewelry with diamonds and precious stones De Simone Jewelry is among the first companies Neapolitan goldsmith to propose this type of objects, especially by offering round-cut diamonds which together with higher-quality choices in jewelry production, will enable it to acquire and retain an additional number of new clients. At present, the company’s business, ranging from Italy to foreign countries very much attracted by the gold market and high jewelery like the United States, France etc. etc. importing precious stones directly from the mines or large cutting centers, or to the creation of jewelery, with particular attention to the quality of gems. Today is also prevailed for De Simone Jewels to work diamonds blacks Brown, representing the trend of recent years, managing to satisfy customer requirements. Al centro di Napoli in Piazzetta S. Caterina a Chiaia ed in Via Toledo, la storica De Simone Gioielli continua la sua quasi centennale attività. In the center of Naples in Piazzetta S. Caterina a Chiaia and Via Toledo, the historic De Simone Jewels continues its almost centennial activities.